In the 1970s, everyone could recite the Reese's Peanut Butter Cup campaign catchphrase: "You got your peanut butter in my chocolate!" Well, here's one for the new millennium: "You got your chocolate in my conscience!" That's the message Reese's parent company Hershey (HSY) received when more than 100,000 consumers let the chocolatier know how they felt about the connection between forced child labor and Hershey's confections. Hershey has announced its plan to purchase Rainforest Alliance-certified cocoa for its Bliss chocolate line by the end of this year. The company has made this move in the nick of time. The International Labor Rights Forum planned to out Hershey's failures in a Super Bowl ad spot this weekend, pointing out that Hershey has fallen behind its rivals in addressing abusive practices in the cocoa industry. According to the ILRF, 40% of the world's cocoa comes from West Africa's Ivory Coast. The Department of State estimates that 109,000 children work "under the worst forms of child labor" there, suffering abuse such as beatings as well as enduring long hours, having to utilize dangerous work tools, and being exposed to pesticides and brutal weather conditions for cocoa production. Meanwhile, 10,000 Ivory Coast children are subjected to human trafficking and even slavery. Those are awfully high prices for some children to pay so the rest of us can snack on affordable Hershey bars. Hershey isn't the only candy company moving toward the moral high ground. Privately held Mars vowed in 2009 to shell out millions to certify that the cocoa it uses in its products is sustainably sourced by 2020. When Kraft (KFT) bought Cadbury last year, it pledged to honor Cadbury's commitment to Fair Trade cocoa sourcing. Nestle (NSRGY) has also committed to buying chocolate that meets international labor rights standards. The fact that Hershey's making a move in the right direction certainly underlines how important consumer advocacy is. The ILRF, Change.org, Global Exchange, and Green America have all done their part for years to ensure that the 100,000 letters from consumers made it onto Hershey's radar. 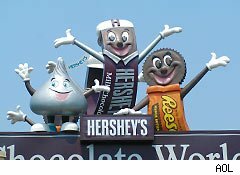 Consumers (including kids) are asking Hershey to do one better. An eighth-grader has started a Change.org campaign asking Hershey to commit to certified cocoa in all of its products going forward. Most American kids love chocolate -- and frankly, so do most adults. That's why Hershey's failure to more fully address cocoa's problematic impact on children in far-off locales seems particularly unappetizing. While it's good that Hershey's making one step toward improving its supply chain, clearly it could still do a lot better in making sure chocolate's safe for all kids, everywhere. Motley Fool analyst Alyce Lomax does not own shares of any of the companies mentioned.